For nearly three years, Dhruv has been a volunteer Director at Strive SCI. “I carry out administrative tasks such as bookkeeping, scheduling, payroll, invoicing, and reception work, and also manage marketing,” he says. When Dhruv was 19, a skiing accident left him with a burst fracture, as a result of which he is quadriplegic. When he was discharged from the hospital, Dhruv and his family found that they had nowhere to go for support. The family founded Strive SCI so that people with spinal cord injuries could access resources to improve their quality of life. Dhruv visited an expo where the Neil Squire Society was exhibiting and learned about the Technology@Work program. The Neil Squire Society operates the Province of British Columbia’s Technology@Work program that provides people with disabilities access to assistive technologies they need for employment, often at no cost to the client. Dhruv was looking for a solution that would help him commute and move around in the office with more ease and less pain. 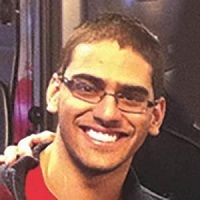 Through the program, Dhruv received funding for a power assist for his wheelchair. The assist was relatively simple to use. “I just trialled it for an hour or so in order to understand configuration instructions,” he explains.